The stock market rebounded from the prior week’s losses following news Wednesday and Thursday that there would be a new series of trade negotiations with China plus an invitation from the U.S. to the Chinese government to discuss trade policy. Investors are hoping the discussions will thwart the implantation of extensive tariffs from both sides and prevent an escalating trade war. The strength in stocks helped to push bond prices lower with Treasury yields increasing despite soft inflation data during the week. On the economic front, there were a couple of significant reports concerning inflation. The core Producer Price Index (PPI) and the core Consumer Price Index (CPI) for August were both below consensus expectations. The core PPI fell 0.1% when economists were expecting an increase of 0.2%, and the core CPI came in at a less-than-expected increase of 0.1%. These tame inflation numbers worked to lessen concerns the Federal Reserve might have to raise rates more frequently than expected in order to cool off an overheating economy. Despite this, the Fed is expected to raise rates by another 25 basis points at its upcoming September 25-26 policy meeting, with the probability of a rate hike at 100%. Further, the probability of a 25 basis point rate hike at the December policy meeting currently stands at 80%. In housing related news, the latest data from the Mortgage Bankers Association’s (MBA) weekly mortgage applications survey showed a decrease in mortgage applications. The MBA reported their overall seasonally adjusted Market Composite Index (application volume) declined 1.8% during the week ended September 7, 2018. The seasonally adjusted Purchase Index increased 1.0% from the week prior while the Refinance Index decreased 6.0% from a week earlier, its lowest level since December 2000. Overall, the refinance portion of mortgage activity decreased to 37.8% from 38.9% of total applications from the prior week. The adjustable-rate mortgage share of activity increased to 6.4% from 6.1% of total applications. According to the MBA, the average contract interest rate for 30-year fixed-rate mortgages with a conforming loan balance increased to 4.84% from 4.80% with points increasing to 0.46 from 0.43 for 80 percent loan-to-value ratio (LTV) loans. For the week, the FNMA 4.0% coupon bond lost 34.4 basis points to close at $101.109 while the 10-year Treasury yield increased 6.10 basis points to end at 3.00%. The Dow Jones Industrial Average gained 238.13 points to close at 26,154.67. The NASDAQ Composite Index advanced 107.50 points to close at 8,010.04. The S&P 500 Index added 33.30 points to close at 2,904.98. Year to date on a total return basis, the Dow Jones Industrial Average has gained 5.81%, the NASDAQ Composite Index has advanced 16.03%, and the S&P 500 Index has added 8.65%. This past week, the national average 30-year mortgage rate rose to 4.74% from 4.71%; the 15-year mortgage rate increased to 4.22% from 4.19%; the 5/1 ARM mortgage rate remained unchanged at 4.02% while the FHA 30-year rate rose to 4.42% from 4.39%. Jumbo 30-year rates increased to 4.37% from 4.36%. 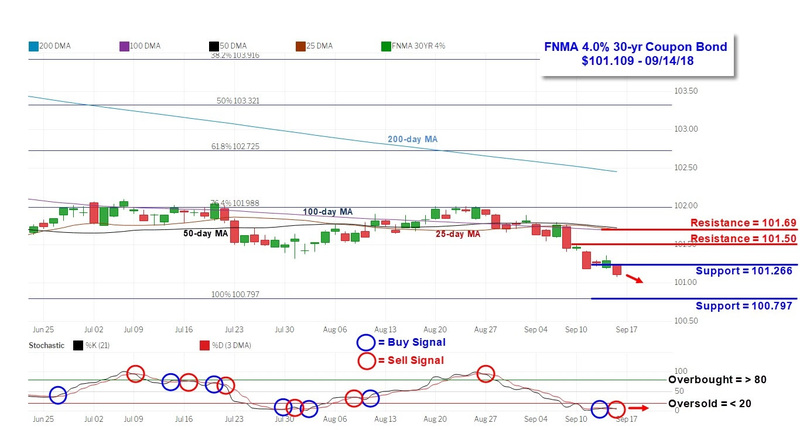 The FNMA 30-year 4.0% coupon bond ($101.109, -34.40 bp) traded within a wider 42.2 basis point range between a weekly intraday high of 101.50 on Monday and a weekly intraday low of $101.078 on Friday before closing the week at $101.109 on Friday. Mortgage bond prices declined below nearest support levels and are now taking aim toward the next major support level at the 100% Fibonacci retracement level located at $100.797. Although the bond is deeply “oversold,” it could stay this way and could continue to gradually trend lower toward the 100.797 level. Should this scenario play out, mortgage rates could slowly rise higher.